Transport Action BC has ongoing concerns with certain aspects of Canada Line (CL) performance and the seeming unwillingness of TransLink to hold the concessionaire – InTransitBC and Protrans BC – publicly accountable for any shortcomings. Significant service disruptions occurred on April 16, 2012, inconveniencing customers for most of the service day. The disruptions, centred on Olympic Village Station and affected service on the entire line. Anecdotal evidence from a TABC member indicates sporadic and crowded service. Possible cause(s) of the disruption have not been publicly released and media coverage of the incident was minimal. Stalled train problems were also experienced at Olympic Village Station on the evenings of April 13 / 14, 2012. Again anecdotally, another TABC member heard that computer control issues requiring staff to monitor trains were, relatively, more frequent, prior to the April 16 incident. It is unclear if these various incidents are related as there has been no public accounting. Transport Action BC requested a detailed, open and public post-mortem on the disruptions. The Canada Line’s operating company has passed the two-year “learning curve” allowed in its contract . Performance penalties should be considered as part of TransLink’s response to the disruptions. Furthermore, evening maintenance has affected Canada Line service many times in the past 18 months. This may be justified, but it seems excessive for a system less than three years old. We are concerned that the perceived lack of action holding the concessionaire publicly accountable for Canada Line performance jeopardizes TransLink’s credibility and its ability to provide a reliable and attractive service. It also significantly weakens the original rationale to use a P3 model to build and operate the Canada Line. Transport Action BC sent a letter to the TransLink Board on April 20, 2012 detailing our concerns but a response has not been received. This blog posting is an expanded version of the contents of that letter. Transport Action BC has responded to TransLink’s request for a major fare increase in 2013. The following issues were submitted to the TransLink Commissioner for his consideration as part of his review of TransLink’s request. Our concerns are with the timing of the fare increase and about transit service and ancillary operations. We feel these issues should be addressed as part of the fare review process. We are not, a priori, against fare increases, as long as they are justifiable to maintain and improve service on a system that is already efficiently run. The 2013 fare increase, if approved, would be implemented just prior to the Compass smart card fare system. Item 15 of the Fares Questions and Answers (Q&A) on the TransLink Commissioner’s web site states TransLink plans significant changes to existing fare media with the Compass card implementation, although no details are presented. This begs the question of why is TransLink proceeding with the 2013 fare increase when its implementation period may be less than a year? There are costs to implementing a fare increase and similar work will be required as part of the Compass card implementation. This could lead to TransLink being questioned on the efficacy of two fare changes in a short time period. From an outsider’s perspective, it would be seem sensible to bundle all fare changes into the Compass roll-out, eliminating one set of fare change costs and reducing public annoyance over back-to-back fare changes, including a significant fare increase. TransLink states (Item 4, Q&A), a fare increase is needed to continue existing service levels and maintain the transit system in a state of good repair. However, TransLink should justify that the transit system is currently operating as efficiently as feasible. Transit system users will notice that TransLink’s vehicles spend large amounts of time parked at route terminals or waiting at timing points along a route. Anecdotal observation suggests this unproductive time is excessive. Examples are short headway routes where 2 – 4 vehicles may be observed at a terminal or twenty minute headway services where a following vehicle arrives at the terminal before the preceding vehicle has left. Layovers may be necessary for service recovery and shoulder period schedule adjustments. They should not be used as a scheduling convenience or de facto method of providing Operator breaks to avoid the rigours of contractual negotiations with the Canadian Autoworkers Union, WorkSafe BC and / or the Ministry of Labour. By way of comparison, the Toronto Transit Commission (TTC) allows its Operators to arrive at terminals 2 minutes before the vehicle’s scheduled departure time. Operator breaks are provided as part of the Operator’s schedule, not the vehicle’s schedule. This keeps vehicles moving and picking up passengers. A transit vehicle is an investment of several hundred thousand dollars. To have such an investment sitting idle for a significant portion of its working day (up to 20 minutes per trip in some cases) is not an efficient use of an expensive resource. Additionally, as more frequent services are introduced, do lengthy layover times lead to unnecessary vehicle purchases to provide that service? Excessive vehicle requirements increase space needs for terminal layover space and garage and maintenance facilities. Optimising schedules to minimise lengthy layovers could result in capital and operating cost savings through reduced vehicle needs. TransLink should state that unproductive schedule time is minimised and schedules are optimised for service efficiency and cost effectiveness. This would support its case that the fare increase is needed to maintain the current system in a state of good repair and ensure service expansion is effectively implemented. Routing inefficiencies in the system should also be validated and justified by TransLink. There are deviations from grid routing that may have been necessary at one time but should be re-evaluated in terms of ridership served, overall route ridership, and impact on route mileage and service hours to ensure they are still viable. To its credit, TransLink has initiated the Service Optimization project which has led to service adjustments by re-allocating resources from some lightly used services to areas of overcrowding. This initiative is laudable and should be a permanent part of TransLink’s service operations design. However, the optimizing process and analysis should be more transparent to the public and politicians in order to rigorously support changes, particularly service reductions. A rigorous, robust and transparent service operations design process enables TransLink to resist political expediency in allocating its limited service resources. The South of Fraser area has received significant increases in transit service, possibly due to political pressure resulting from claims that Surrey residents “pay” much more to TransLink than they receive in service. Future increases to transit service, anywhere in TransLink’s service region, must be based on clear evidence that that is the best use of those resources, not the politically convenient one. Any deviation from this policy must have clear lines of responsibility and accountability published. Once service is established, TransLink and its subsidiaries should ensure that full use of available technology is made to monitor and regulate service. TransLink has a GPS-based AVL which monitors vehicle location and schedule adherence and allows two-way communication between Operators and a central control facility. TransLink should assure the public that the AVL is being effectively used to ensure transit service is operating as close to schedule as feasible. Controllers should be responding to transit service disruptions (delays, off schedule, surge loads, collisions, etc.) by proactively re-routing service, short-turning vehicles and otherwise adjusting the transit system to minimise passenger inconvenience. The roles and responsibilities of the Transit Police and Coast Mountain Bus Company (CMBC) Transit Security group should be reviewed and clarified to minimise overlap, maximise co-operation and ensure that each group is truly necessary and making effective use of its resources. We have several questions on this topic. Is it necessary to have two separate organisations, within TransLink, doing the same function – essentially checking fares? Are large, police-special Dodge Chargers an appropriate vehicle for the CMBC Security Group? The Transit Police seems to have defaulted to being the SkyTrain Police. What is its role vis-à-vis the rest of TransLink’s facilities and service region? Can the public should be assured that the Transit Police are principally engaged in transit-related duties and not acting as a quasi-regional force dealing with matters more appropriately dealt with and funded by municipal forces? Where do SkyTrain and Canada Line Attendants fit into the security matrix? None of these queries should be construed as stating TransLink’s security services are unnecessary, ineffective or wasteful. What is needed is clarity to and visibility around their functions, effectiveness, funding, and resource utilisation. Allow TransLink to provide planned service. Encourage TransLink to minimise expenses. Keep fares as low as possible. TransLink will have a more effective and supportable rationale for its proposed fare increase, if it publicly addresses our stated concerns. Openness and transparency can only assist TransLink make its case on a sensitive issue such as a fare increase. Formal public presentations and hearings should be considered. Canada Line P3 “Get Out of Jail Free” Card? Transport Action BC members raised concerns about Canada Line service incidents that seriously affected its passengers, with no publicised action taken against the line’s private sector operator (InTransit BC / Protrans BC) by TransLink. The Canada Line is, possibly, the most vigorously debated of the provincial government’s Public-Private Partnerships (P3) projects. Under the P3 model, a private sector concessionaire may finance, design build, and /or operate a specific project and assumes some project risk, in return for a guaranteed investment return. However, the concessionaire contracts to provide a certain level of service. 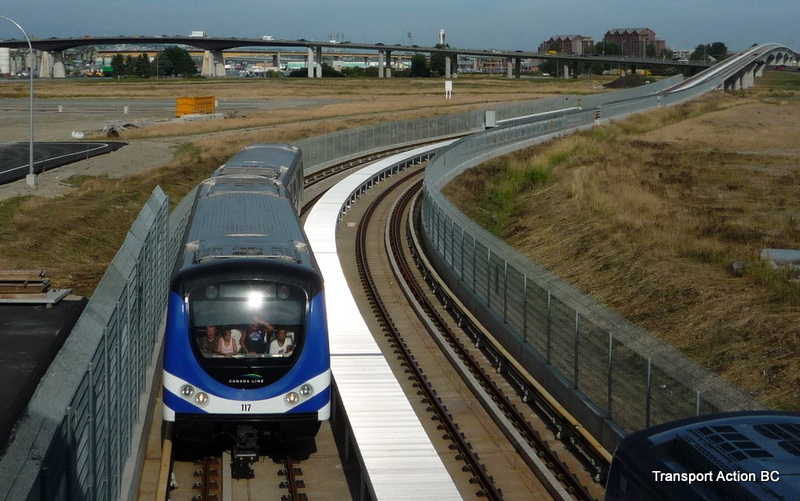 Penalties should be considered by the project’s owner (in this case TransLink), if contractual obligations are not met. Essentially, the concessionaire does a detailed risk-analysis and decides how best to do the project while minimising its costs, maximising its returns and avoiding penalty payments. There are two incidents that concerned Transport Action BC. Both incidents resulted in significant and lengthy disruptions to Canada Line passengers. The first was the morning-long shutdown of the line on 26 November 2010 due to snow and ice build-up on the line’s 3rd rail. Transport Action BC felt that the Canada Line operator should have been able to handle a snow storm that, while uncommon, can reasonably be expected in a Vancouver winter. 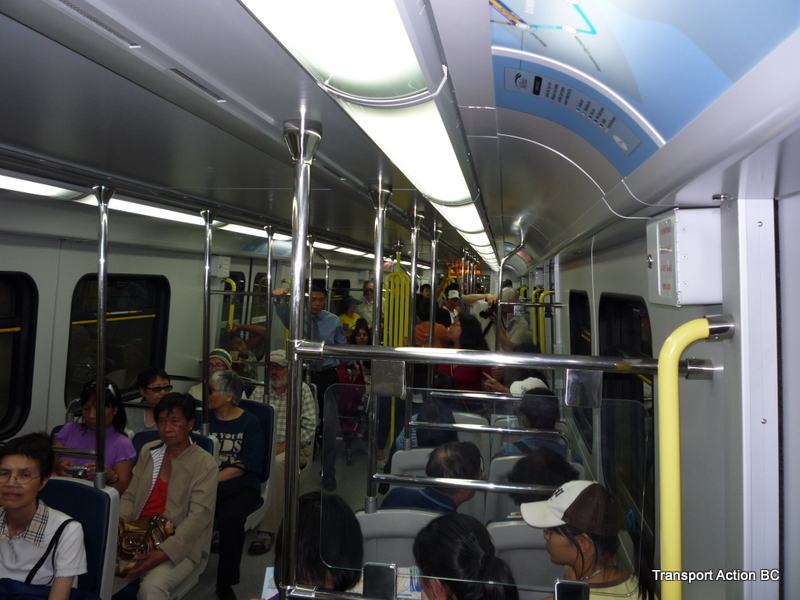 The fact that TransLink’s SkyTrain lines successfully operated under similar conditions shows that it could be done. Our concern was that the concessionaire had underestimated weather-related risks in the design of Canada Line elevated structures and inclement weather operating procedures. Under our understanding of a P3 scenario, this should have resulted in a penalty to the concessionaire. The second incident was a series of late-night, service reductions to Canada Line service for track maintenance in February, March and April. Customers had to deal with reduced rapid transit service, shuttle trains or use the parallel bus route (albeit with more frequent service). This level of maintenance was a concern because the line was barely 1 ½ years old. Was there some underlying design flaw that resulted from the concessionaire’s risk analysis? Transport Action BC sent letters to the TransLink Board of Directors after each of these incidents and received responses each time. The first response indicated that the November 2010 shutdown was part of the two-year “learning curve” for the new transit project and penalties were not justified. In addition to the track maintenance issue, our second letter questioned the rationale for a “learning curve” on a P3 contract. We felt that the concessionaire had made design decisions based on its risk-analysis. It should be responsible for those decisions and held accountable for any significant passenger impacts. TransLink’s response to this letter stated its contract with InTransit BC / Protrans BC included a moratorium on performance penalties for the first two years (until 2011 August 12). This was a revelation to Transport Action BC and, we suspect, most members of the public are unaware that such a loophole exists in the Canada Line contract. There are several concerns with this. What is the reason for this contract concession? It certainly violates the spirit of the P3 mantra as presented by P3 supporters. Do other P3 contracts include similar conditions? And, most importantly, how would the customers affected by Canada Line service failures feel if they were told that, other than some bad publicity, the line’s operator was not penalised for its failings? Comments Off on Canada Line P3 “Get Out of Jail Free” Card?